Play the Pimp My Ride "Ride Pimper" Game Online! 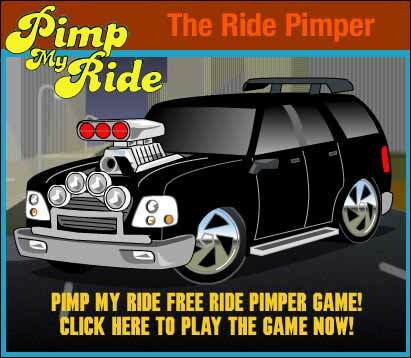 When was the last time you played the Pimp My Ride ‘Ride Pimper’ game? If you dont have a clue what I’m talking about – It’s a game where you can pimp out rides like X and the crew do on Pimp My Ride! XzibitCentral.com now has the Pimp My Ride Ride Pimper game on the Pimp My Ride page at XzibitCentral.com! Click on the image below to the play the game! Play the Pimp My Ride Ride Pimper Game Free at XzibitCentral.com! If you haven’t played the game before, or it’s been a while and you want to give it another go, click on the link above to play the game! If you really like the game and you want to tell everyone about it, there are a few images and links that you can put on your website or myspace page – just scroll to the very bottom of the Pimp My Ride page and there will be 4 boxes with code in them – all you need to do is copy that code and paste it on your website or myspace and all your friends can come and play the game too! So go to http://www.xzibitcentral.com/pimpmyride.php and scroll towards the bottom and the Ride Pimper Game will be there ready to play!